Ah, the Feast of the Assumption! What a glorious feast indeed! It’s that feast when Mary enters into the Kingdom of God and embraces Her Son, the Christ, who has been utterly victorious! It is when she officially begins her role as Queen of Heaven, the Queen Mother of the triumphant Christ! There are many gorgeous, gorgeous artworks depicting the Assumption, but the one that caught my eye in particular was this one. Like many of the pictures of the Assumption, the disciples are huddled around an empty tomb. The tomb was supposed to contain the Virgin Mary, having fallen asleep in Christ. But, she is not there. She has disappeared. They cannot see her, so they peer at the tomb with amazement. It is a miracle, but they do not know what is going on. But, from the heavenly perspective, Mary is there! She is clothed in a beautiful robe lined with gold and she is beautiful and magnificent to behold. Angels tug at her robes to take her into heaven, but her arms are outstretched as if to embrace the disciples. Though she is leaving them, she has not forgotten them, and her expression is tender toward them. 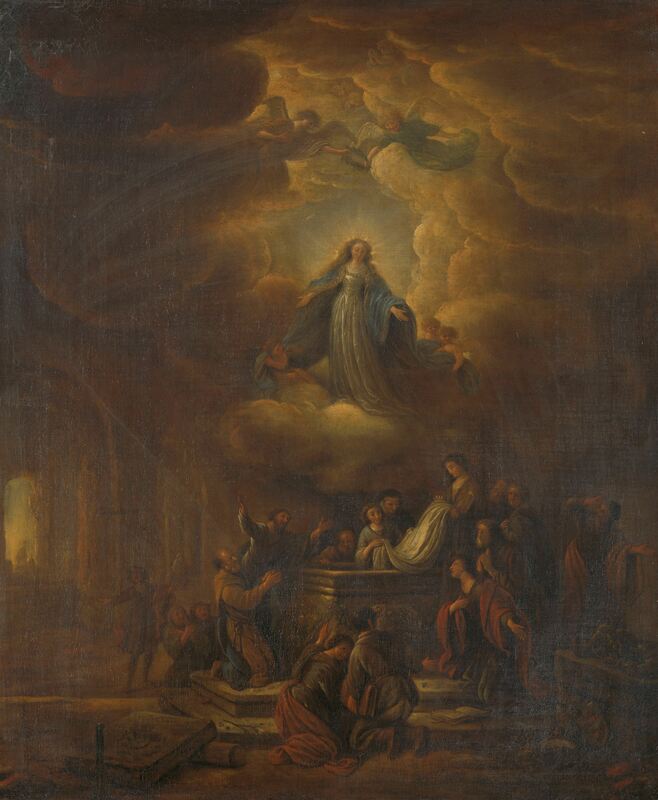 Assumption of the Virgin, by Jacob de Wet (I), c. 1640-72. Rijksmuseum, Amsterdam, Netherlands. Today, when the priest read the gospel, I was a little confused at first. We were celebrating the Assumption, which is a Glorious Mystery which occurs after the Resurrection, when Christ is victorious. Yet, the gospel backtracked all the way back to the Visitation, in which Jesus is not even born yet! And, in those gospel readings for today, Mary, in her meeting with Elizabeth, proclaims a bold thing… she announces that all generations will call her Blessed. This, of course, begs the question: what does it actually mean to be blessed? Does it mean, as often people suggest, that it means being able to afford nice things? Or maybe it’s being associated with certain people, as others would suggest. Or maybe it’s just having God on your side. But, when I looked up the word, a different definition popped up: to be blessed means to live in Heaven with God. And, so, what does it mean that all generations will call Mary blessed? It means that she is living in Heaven with God. And so, what are we celebrating when we celebrate the Feast of the Assumption? Simple. God keeps His Promise. Mary is indeed blessed and joins Jesus, body and soul, in Heaven, as He has promised. And, God-willing, we will follow her. Help us love and honor Your Mother, whom You have given us to be our own. Help us follow her example in holiness to be with You.